Maintain your computer with WinUtilities 1-Click Maintenance. Defragment Drives, Clean Registry, Delete Temp Files! Everything is in the name. To keep your Windows system fast and stable, use WinUtilities 1-Click Maintenance. It regularly and automatically takes care of the most important maintenance tasks for your system. Uses drive defragmentation to speed up disk access! In the background, WinUtilities changes the configuration of files and folders to make it easier and quicker to read them. Regular defragmentation is essential, especially if you often make changes to the data on your disk (whether by moving or changing files or installing new programs). In the Increase performance area of WinUtilities DiskDefrag, read why defragmentation is essential to keep Windows running smoothly. Makes sure there is order on your desktop! 1-Click Maintenance checks whether there are invalid shortcuts lurking on your desktop, in the Start menu, or in the Quick Launch bar and automatically removes them. At the same time, it looks for invalid entries in the history lists of various programs such as Windows Media Player and Microsoft Office. You will learn more in the Clean up Windows area of WinUtilities Shortcut Fixer. Deletes files that are no longer needed! So-called “temporary” files are a plague. Windows and application programs store temporary files on your hard disk to save settings or data for a short time. Before exiting, the program in question should really delete these files. In your dreams! The program often forgets to clean up after itself and so lots of useless data sits indefinitely on your disk. You can rely on 1-Click Maintenance to delete all temporary files and folders from your hard disk. Over time your Windows registry fills up with hundreds of unnecessary entries. These include references to files that no longer exist, leftovers from long-removed programs, and invalid entries. 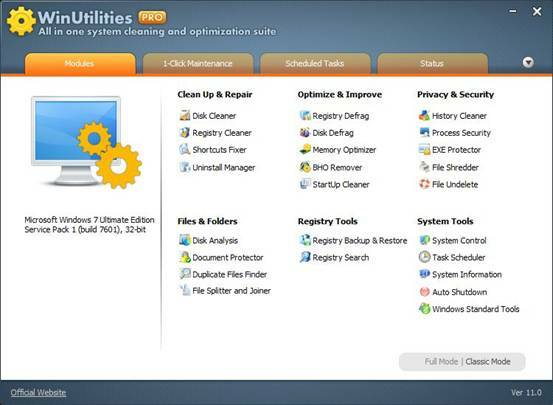 1-Click Maintenance cleans up the registry, ensuing your Windows system runs smoothly and error-free. In the Clean up Windows area of WinUtilities Registry Cleaner, you will learn more about cleaning up the Registry.